It has been a strange spring for the maple trees. I’ve been tapped now for a couple of weeks. It looked promising early in the season when I tapped. Then came several blizzards with heavy snowfall and cold weather, back-to-back. The temperature has been flirting with the freezing mark, but the trees are understandably skeptical. Today I went out there again, and there was not enough sap in the buckets to warrant emptying them. There is so much snow that I have to use snowshoes just to get out there, and the gather is that much harder on snowshoes. I’ve probably gathered around 10 gallons of sap so far. As you can see in the picture, it is mostly ice. 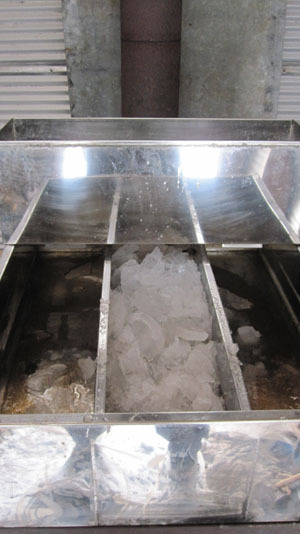 I have to tip the buckets, and sometimes hit them hard on the bottom to get the ice out into the gathering bucket. This is then dumped into the evaporator pan. There has not been enough gathered yet to warrant lighting a fire, so the ice just piles up. The weather report is calling for highs in the 40s towards the end of the week. I hope the trees feel inspired by it. This entry was posted on Sunday, March 24th, 2013 at 8:54 pm and is filed under Uncategorized. You can follow any responses to this entry through the RSS 2.0 feed. You can leave a response, or trackback from your own site. We just wanted to let you know how much we enjoy reading your blog. It’s good to know what’s going on in the neighborhood with the trees and such. You are a very good read, quite enjoyable writing. PS: you really know how to get a truck out of the ditch!